It would be nice to be able to set a min/max value, when assigning to a Perform knob. When Knob 2 is set to 100%, then Resonance goes to ~50%. You may need to make the Browser wider, by dragging the left-hand edge, to see the knobs. 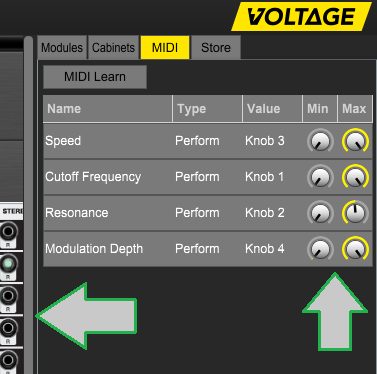 You can also set the range when a MIDI Cc number is "MIDI Learned" to a Performance knob. Last edited by DarkStar on Thu Feb 07, 2019 10:36 pm, edited 1 time in total.